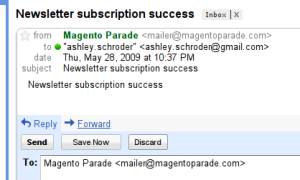 Just a quick note to say I have added some new functionality to the Gmail or Google Apps email sending extension I wrote for Magento. Basically several people asked for reply-to functionality, that would use the Magento store addresses that were being used on the outbound email. The change was very minor, I guess I just didn’t see it as being important at the time. Anyway, it’s a configurable option now, so feel free to either use it or not. You can get the extension from Magento Connect. Also here are some screenshots showing the new configuration option and also how emails sent using the option or not using it. 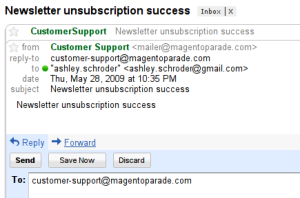 The Gmail and Google Apps email configuration for Magento is very easy. You’ll notice no real changes here, just one new Yes/No option that if enabled will use the reply-to functionality shown below. 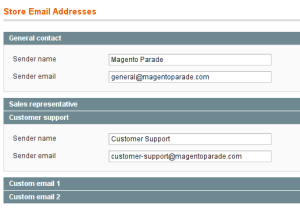 Basically the reply-to email will be the one Magento is configured to use from the below Store email addresses screen. These are the email addresses you will see in the reply-to field as shown in the examples below. The default behavior is to send with no reply-to, as it seems the trend is toward automated emails that do not receive responses. This image shows the default non-reply behavior, the from email is used as the to email for any replies. This shows the new feature, a reply-to field that email clients will use to populate the reply to field. This screenshot shows the use of the reply-to where Gmail will send the reply to the given email rather than back to the original sender address. If you have any questions, feedback etc I’m always keen to hear it so please comment or contact me directly. Nice work buddy. I have been using this in my dev environment without issue. We plan to use it in the release of our store when it’s ready (the store that is). I installed google apps a few weeks back. Everything is working fine, except for when new order comes in, Magento is not sending emails to admin. Emails go to customers just fine. I have set up everything under Configuration / Sales Emails but still no sales emails go to admin. Do you see them in the ‘sent’ folder when you log into the google apps web interface? Thanks Ashley for this great extension. I have installed your extension, set up everything, but when I run self test I get an error. What is the problem? Can you help me out? Thanks for using my extension. Please check that you host has openssl installed and enabled. You can check it with a phpinfo() too. Let me know. Thanks for the extension Asley. I too had that issue as Dean. It was solved by installing openSSL setup and then by enabling openSSL in php.ini. Then before running the ‘Self Test’, the configurations need to be saved in Confiuration/Adanced/system. Hi Ashley, I have the same problem as above. I have OpenSSL installed, enabled in the php.ini and also enabled within Confiuration/Adanced/system. Just to update for future reference, the OpenSSL not being installed etc is normally always fixable by your hosting provider. That error usually means that you have used the wrong username and password a couple of times and now you need to log in using the gmail/google apps web interface to solve the captcha and prove you;re human. Did you log in to the web front end for gmail? I’m not sure, here’s an idea: try to create a brand new ‘disposable’ gmail account for testing – enable IMAP in the gmail settings and see if that works? We’ve been using your extension and it works well for us. 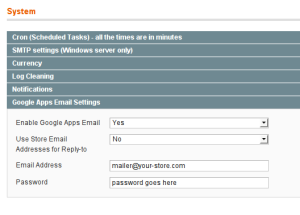 However, on SMTP Pro Email SMTP Settings when we enable ‘Use Store Email Addresses for Reply-to’ . Our mailer no longer works unless the Smtp username is similar with the email address stored in the store email addresses. What could be the problem? I have installed version 1.4.3 from the magento connect site on my magento CE version 1.7 and I am not receiving emails. I did try your test button, and it said everything was good and sent an email, but the email never made it to my google account. Does the extension work with version 1.7 or do I have some other issue specific to my site? Looks like I got it working… Unfortunately I changed more then one thing and Im not sure which did the trick. I manually defined Gmail in the SMTP pro section and then recompiled all software and flushed cache. the orders still go to our orders@kingdom59.com address but also come to our memberserices@kingdom59.com address, why? the others such as forgot password we never had them going anywhere as it was an automated email, now we are copied on everything. How can we fix this?